While all Wood Heating Pellets are an eco-friendly choice, switching to bulk softwood heating pellets goes further because if keeps landfill cleaner by eliminating bags that need to be disposed of. BULK SOFTWOOD PELLETS are delivered to your home or business using our specialized delivery equipment featuring a vacuum system for blowing the pellets into your pellet bin, storage room, or a super sack. Bulk softwood pellets can more easily be loaded into your stove using a bucket or they can automatically be fed into your boiler. If you choose to purchase softwood pellets in bulk you’ll need a place to store the pellets that is easy to access and refill. Make it even handier by installing a pellet bin fill kit with outside hookups. 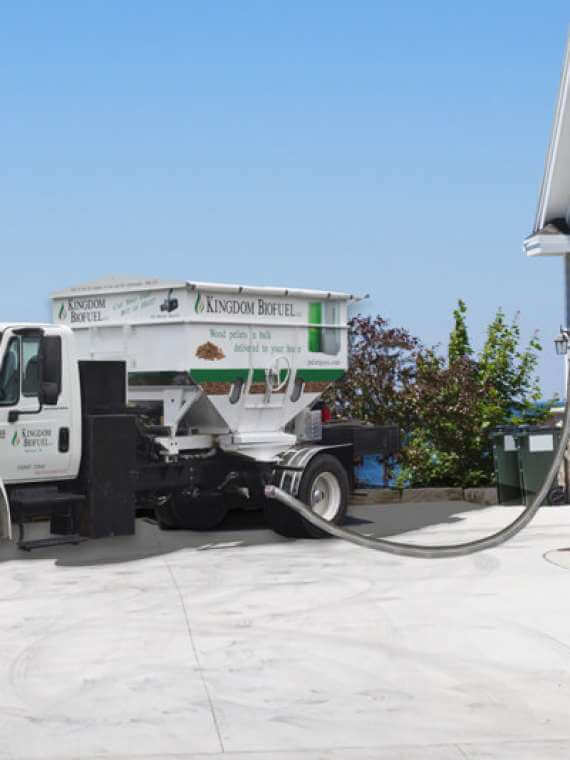 Our pellet delivery truck will hook up to the outside nozzles and blow the pellets directly into your bin. Get free bin plans here. Another option is a pellet storage shed that you can place on your property for pellet storage. The shed comes equipped with outside hooks for easy refilling. The cheapest option is our Free Super Sack (with first purchase). Our super sack holds one ton of pellets and stands at a convenient height for easily scooping out the pellets with a bucket. The super sack can be placed in your basement or front porch and the top can be closed with plastic to keep out moisture. How do I store Bulk Pellets? There are a number of options for storing Bulk Pellets. First and cheapest of all is a Super Sack that comes free with your first purchase. The driver brings the sack along, sets it up in your garage or basement and fills the one-ton sack with pellets. 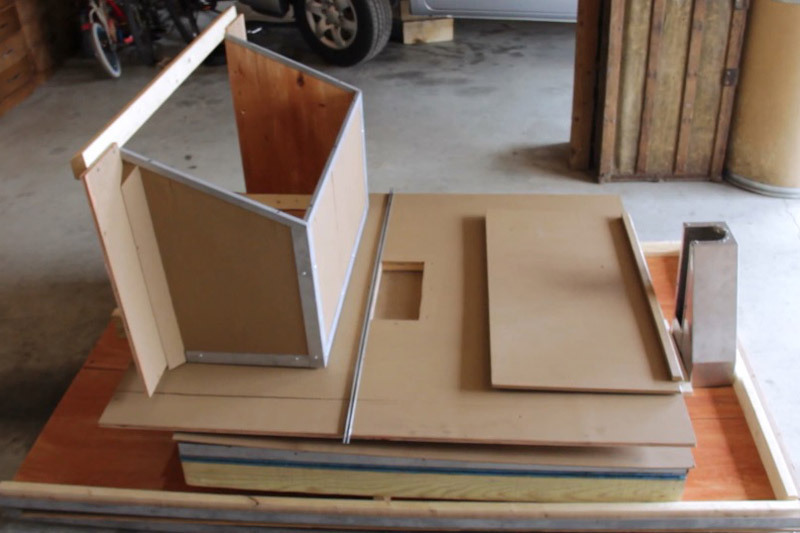 We also offer a DIY Pellet Bin that can be assembled very quickly in your garage or basement. 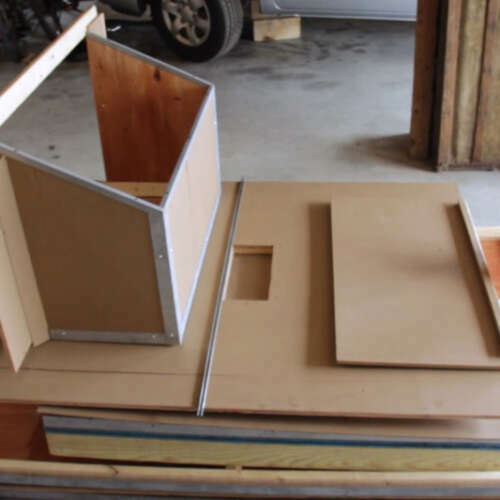 If you’d like a custom bin built in a unique space, we’d be happy to give you Free Advice on how to build it or even give you a price on building a custom pellet storage bin for you. Get your free bin plans here! How does bulk pellet delivery work? Our pellet delivery truck comes to your location loaded with bulk hardwood pellets or bulk softwood pellets. The special vac system blows pellets into your bin, Super Sack or in a pile on the floor. The most efficient and easiest way for you to have bulk pellets delivered is to install a bin with a bin fill kit. That way our truck can park outside your house or business, hook up to the pipes and simply fill the bin. It’s easy and you don’t even have to be home to open the basement or garage door! What is the difference between bagged bulk pellets and regular bulk pellets? Bagged bulk pellets are just that: bagged. A half ton of pellets fits on one pallet. We deliver the pallet of pellets to you and place it in your garage or near the place where you would like to stack them. However, our bulk hardwood pellets and bulk softwood pellets are a different system altogether. Bulk Pellets are stored in bins or Super Sacks. Our vacuum equipped truck comes to your location and fills the pellet bin then we charge for the pounds that were delivered just like an oil truck would deliver and charge for oil. You only pay for what gets blown into the bin. There is much less hassle as you don’t have to carry and stack pellet bags all winter long. Where can I find plans for a Pellet Bin? Right here! 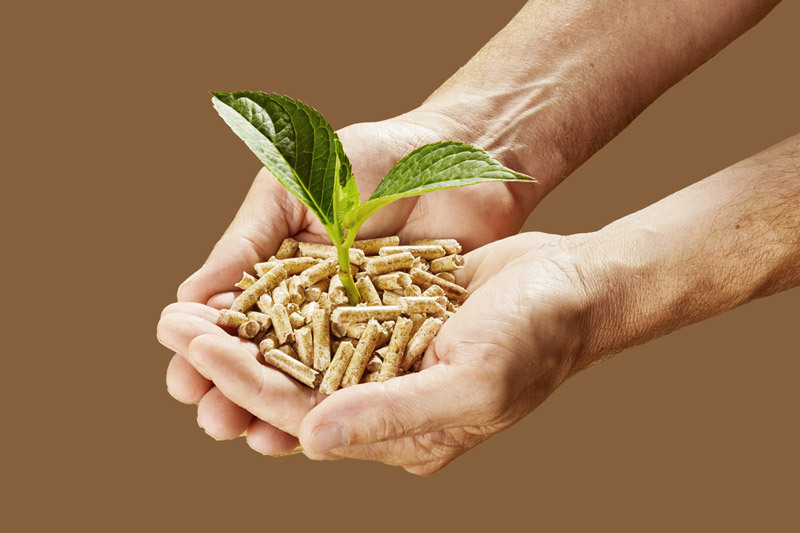 We offer Free Pellet Bin Plans to help you get started with bulk wood pellets. You can simply go to Home Depot or Lowes and buy the materials and then order a Fill Kit for the Bin so the bin can be filled from outside the house. Will you come and build a pellet bin in my basement? You bet we will! Send us some photos and measurements and we’ll give you a ballpark figure of what it would cost to send our bin builders to your home to build a customized pellet bin. There are 1001 ways to build a bin so get creative. If you need ideas to inspire your thoughts, click here. What if I don’t have interior storage space for bulk pellets? We even have a solution for that! Buy a pellet storage shed and equip it as a storage bin in the backyard. With the addition of a fill kit, our truck can simply hook up the vac hoses to the kit and fill the bin when needed. What is Your Question regarding our Heating Pellets? We have purchased several brands of pellets over the years. 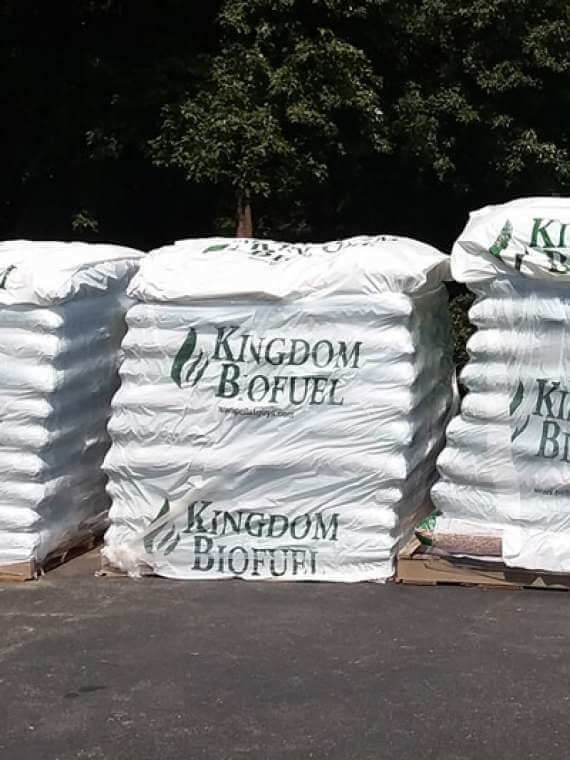 The pellets from Kingdom Biofuel surpass all others. I won’t get pellets from anyone else. Clean burning and less ash. I would recommend these to everyone. VERY SATISFIED WITH THE LOOSE PELLETS, WILL BE ORDERING MORE IN FEBRUARY. Great Product! Great Service! Great Price! 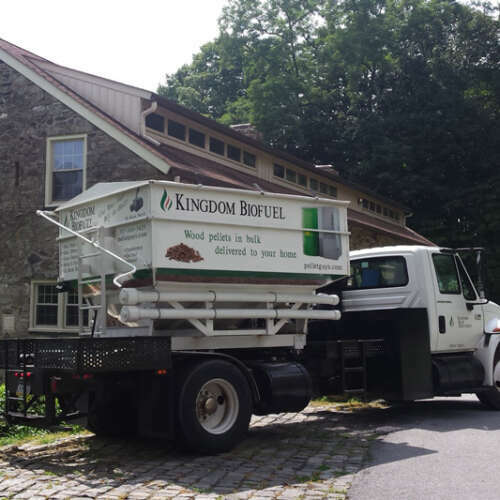 I highly recommend buying bulk pellets from Kingdom Biofuel. They only sell the premium pellets which burn hot with very little ash and at a great price. They have always gone out of their way to accommodate my delivery. I am very happy with the service I received for the last three years and I will continue to purchase my pellets from Kingdom Biofuel. We have been burning pellets over ten years and used many different brands. The Kingdom Biofuel burns cleaner with less ash and dust. They seem to burn longer and warmer. Glad we found you in Peach Bottom PA.
Great Pellets. They are the cleanest burning pellets we have used in 4 years and will continue to buy. The customer service is great and the quality of the pellets is above what we have used for years. There is very little ash and the pellets burn hotter! 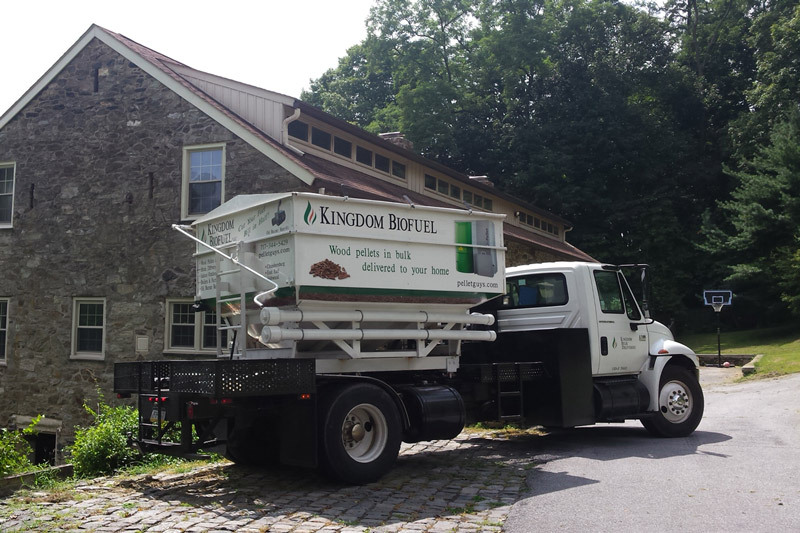 I highly recommend Kingdom Biofuel to all who use wood pellets! Thank you for your amazing customer service. Happy Holidays! My only only question is my recent order burns great but not very clean. Much more ash then last year. Any suggestions? This was our first order from Kingdom Biofuel and it will be our last.! On the phone and website everything was fine but when the driver got to the house he was R U D E! I was so shocked I just turned around and went back into the house numb, stunned. If I’d been in my right frame of mind I would have refused delivery. There is no excuse for treating people so poorly. Great Company with wonderful customer service! Kingdom Biofuel is great. High character, Hard working. These guys provide a great service with bulk wood pellets. Their prices are good and they are always looking for ways to help the customer and provide an efficient service. We’ve tried several kinds of pellets at different prices & these are the best! They burn better & hotter. They keep our house 3 or 4 degrees warmer at the same setting than other pellets we’ve had. Great father & son team. So glad we found out about you! Ephraim and Steve are great guys. They really go out of their way for their customers. 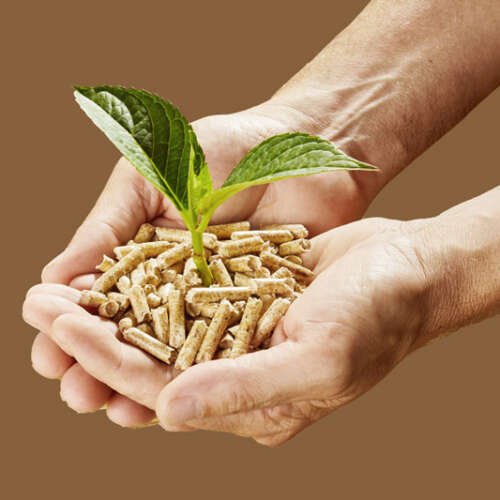 The wood pellets they provide work great in our wood pellet boiler. Can’t say enough great things about the company. Excellent service and great price. Thanks, Kingdom Biofuel! !